After a recent group policy change, I have noticed that new settings are not being applied to one of the servers. 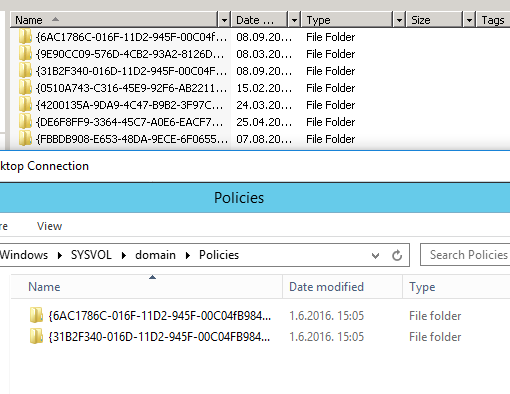 After some investigation, I have noticed that the SYSVOL folder is not syncing properly and that there is a different list of policies on 2 Domain Controllers. I was also getting errors by Group Policy not being applied with an Unknown Error message. We are using a mixed environment with Windows Server 2008 and 2012 Domain Controllers. Until we solve this issue we have to change the Domain Controller from which this policy was applied from. Connect to the server that has the wrong policy applied. After the change update the policy with gpupdate /force command. Now your server should receive the correct policy.